Friends we are in Fido Friendly Magazine. This magazine has some shnazy beds in this issue too. OH look you guys! You're in a magazine!! Can we have your pawtographs??? Hmmm you all are like famous. The cameramen will be after you soon. That's pretty cool. You two are just superstars! 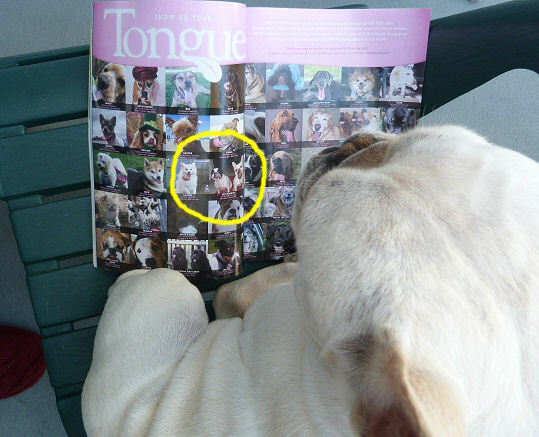 Congrats on showing your tongues in the magazine! Wow!! Your modeling careers are really taking off! You look marvelous. Mesa is in the next issue! You are the cutest guys in there. I want you to know I just adore you both. I know someone famous now!!! Now that is just cool! Mom's been hoping to get our Adirondack chairs out soon, too! You two are definitely model material! I'm so lucky to have such cool famous friends! Wow, you're famous!! That's totally pawesome. I'll have to check out that mag! So cute! You are celebrities! Squeeeeeeeee you two are FAMOUS! How fangtastic to have my furends in a fur REAL Magazine!!!!! How furry cool! You two are now FAMOUS!! OMD you two are FAMOUS! Woo Hoo - we see you there!!! How lucky are we to know two special starlets. You two make great models. Holy Pug! We want one so we can brag to our other furiends that we know celebrities. Noticed that there is a handsome Boston T. on the cover wif the lady from Days of our Lives! Bark and Woof, there you are in the print. I can't believe it. I know Movie Stars in PRINT. I am so darn tickled. I guess my Mom hasn't been hanging me out in the right places. DURN. FIDO hu? What else is in the magazine? I think I am being gipped for sure. MOMMMMMMMMMMM... Where has that human gotten off to? I am so tickled to see you two in print. So cute. You are both precious. LOVE it. We see you......glad you circled it! BOL. OMD, WE HAVE THAT MAGAZINE! We are looking at you, you are famous! I know Super Stars YEAH!!! Benny and Lily are so FAMOUS!!! Can I have your pawtographs? Please Please??? Can we have your Pawgraph!! We love Benny Pit!!! anf Lilly!! You are famous! Lucky dogs! Congrats!!! And we love your new beachy header photo! OoH My!! You two is famous! You are celebrities! Can I have your pawtograph?? How awesome to be in a magazine! How does it feel to be famous?! You're famous!!! But we always knew that. I knew that you'd be in a magazine someday! You make me smile from the very first photo each time I visit! You guys are two of the most famous doggies we know! How cool! Check you out!! Very cool! You guys are FAMOUS! How cool is THAT?!?!? Awesome! Hope this doesn't mean you're going Hollywood on us.